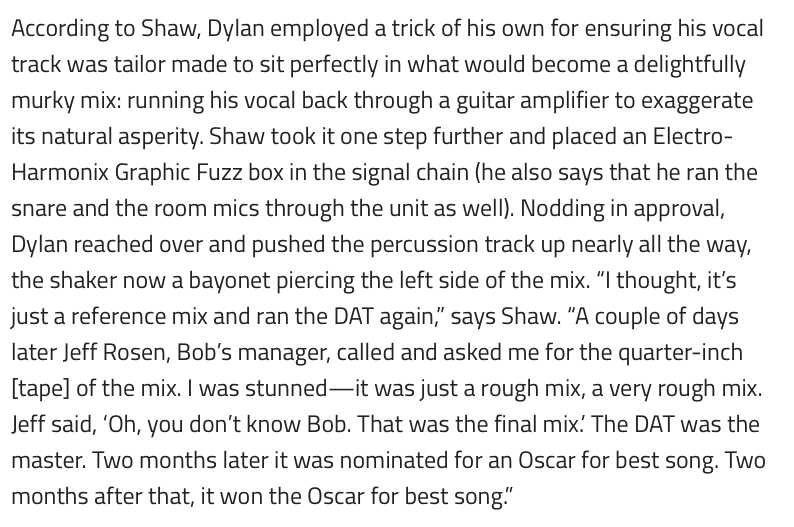 In [this article](http://www.emusician.com/artists/1333/recording-bob-dylan/40613), about recording Bob Dylan, it says, "According to Shaw, Dylan employed a trick of his own for ensuring his vocal track was tailor made to sit perfectly in what would become a delightfully murky mix: running his vocal back through a guitar amplifier to exaggerate its natural asperity. Shaw took it one step further and placed an Electro-Harmonix Graphic Fuzz box in the signal chain..."
According to [this description from the back of the 1982 promotional LP "Indisciple"](http://imgur.com/a/2sB40), Belew's rig included a Graphic Fuzz pedal. According to Premier Guitar's Rig Rundown with AFI, Hunter uses an EHX Graphic Fuzz. He said in that interview that he uses an Electro Harmonics Graphic Fuzz. when he was asked about the effects which he uses on stage. Article shows pictures of Boris's gear, the Graphic Fuzz can be seen in the first two pictures. For the true tonal alchemist, the Electro-Harmonix Graphic Fuzz XO is a unique distortion pedal with 6-band EQ, sensitive to the dynamics of your playing. Sliders for Overdrive, Sustain, and Volume further its array of tones. Use the Graphic Fuzz guitar pedal solely as an EQ or switch on the distortion for total sound sculpting. Great EQ pedal with distortion included. I don't really see why is it called a Fuzz, it works rather as a Drive-Distortion kind of pedal. has sustain, response, and a graphic EQ, great for sound design, live ...maybe, if your into effects and experimental sound, this could be your pedal.